Your on-page strategy is the foundation of your off-page efforts. Think of it as writing a good story. If you don’t get the basics right, your off-page strategy will fall out of line and make it difficult to get first page organic rankings. An effective on-page strategy puts your campaign into motion and makes it easier to compete for top organic positions. Once you know which areas to fix the site, you can determine the direction of your campaign and how much effort you’ll need to put into link acquisition. Our on-page methodology falls within the first month implementation of your campaign—this starts 24 to 48 hours after launching your SEO project. We immediately (and sometimes before acquisition) conduct a keyword research to determine high-value and high-ranking keyword sets. Our marketing specialists will also start a manual audit on your client’s site to spot errors and create a checklist of areas that need optimization. After completing the keyword research and an SEO audit, we move forward with our recommendations. We provide our on-page recommendations through: On-Page Structural Report and Meta Data and Content Optimization Report. This outlines the complete recommendations for site improvements. We provide this report at the start of the campaign—usually sent within two business days from payment. This is a rundown of our recommendations for each website element. 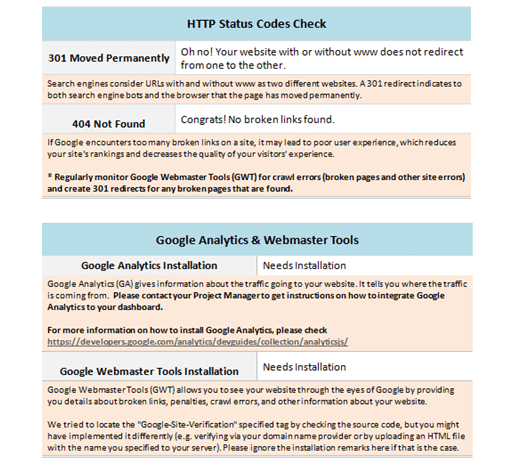 This serves as an overview of basic website issues that require attention − page redirects, broken links, sitemaps, Google Analytics installation and Webmaster Tool, URL structure, Robots.txt, Meta tags, and social media buttons. This includes the total backlinks that point to your client’s site, the anchor cloud, and a breakdown of the site’s link portfolio. 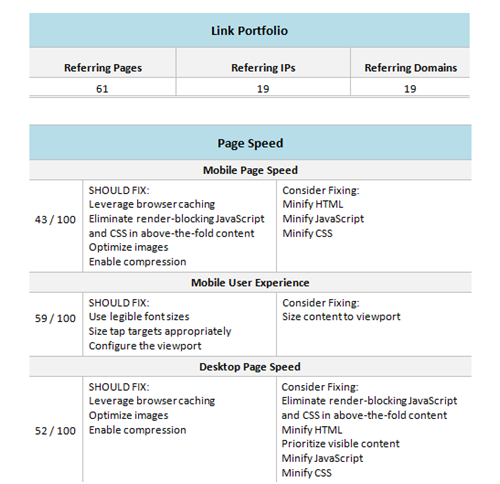 You also get recommendations regarding webpage speed (mobile page speed, mobile user experience, and desktop page speed). Metrics measured, traffic, and indexed pages are also highlighted on this section. This is a recommendation of rich snippets that your client’s website needs. We provide different options and clear instructions to get you started with your rich snippet integration. 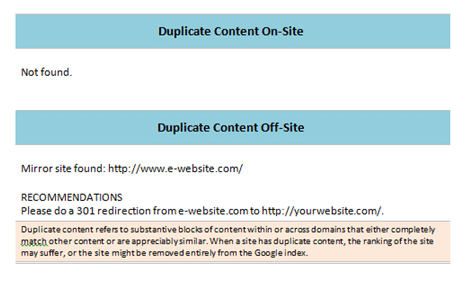 This shows if we have found duplicate content on-site and off-site. We will provide the appropriate recommendations to address the issue to avoid duplicate content penalties. 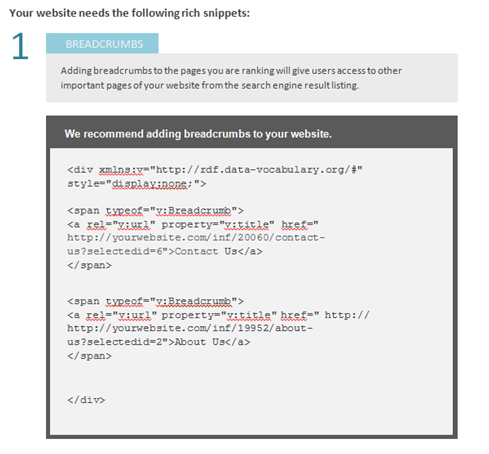 This provides the complete recommendations and instructions for Meta Data and web copy to be created for the website. We send this report after the campaign’s launch—five to seven business days, or after completing the keyword list. For new campaigns, we create the MDCOR from scratch to include the keywords for every target page. We conduct website revisits for regular campaigns if there are additional keyword sets or if there are changes on the content. 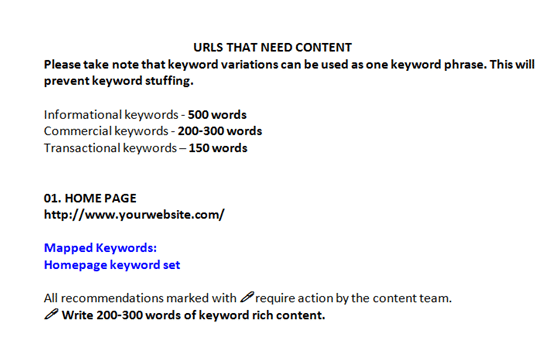 This determines the pages we will be ranking based on the approved keywords. This appears in table form and indicates which individual keyword belongs to the appropriate page. This shows the pages that require Meta Data. The pages included in the Meta Data creation don’t necessarily have to be new pages; we also improve the Meta title and description of existing pages. This indicates the pages that need content. We provide the mapped keywords for the specific landing pages and the recommendations to be applied by our writers. 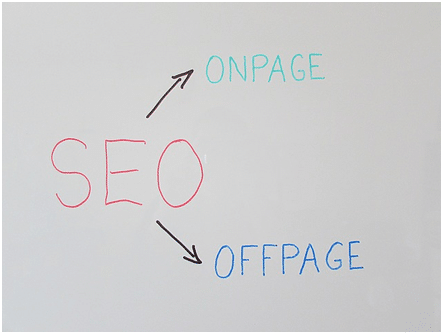 Balancing your on-page strategies is important to set your off-page efforts straight. Once you get the right mix for both areas, you’ll have no problem pushing your client’s site up the SERPs. Understanding the business model is the most important, but is also the most neglected aspect when it comes to on-page optimization. You must have a full grasp of how the business goes to make the appropriate website recommendations. Above all, focus on the site’s goals. Value proposition is like a side dish to your website strategy. Without this, your on-page strategy will be incomplete, which leaves your off-page efforts dangling. Value proposition is often highlighted in the website content—the clearer the message, the more likely visitors will stay on the page and convert to customers. Website audits help you escape scenarios that will hinder your on-page strategies − from avoiding an algorithmic penalty to fine-tuning the content. Our project managers request site audits before and after launching an on-page optimization campaigns. This helps us uncover underlying issues or opportunities to improve your strategy. Keywords are like seeds, and Google sows these seeds to rank your site. A good keyword strategy will balance your on-page efforts to your off-page. With proper keyword usage, frequency, and variations, page segmentation and targeting will be easier. With a great on-page strategy, you can bring in conversions and push your client’s site to first page rankings. Follow the best practices we’ve set forth and discover the tremendous success you can achieve for your campaigns. Get in touch with our team today to get ahead!